We are once again in the thick of the tick. 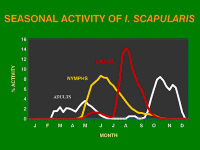 Late October and early November are the most active period of the year for adult deer ticks, the species primarily responsible for the spread of Lyme disease. If you spend time in the woods and fields of the Northeast, here are some useful tips for protecting yourself—and your pets—from their potentially infectious bites. 3) Check yourself and your pets regularly, constantly, especially if you’ve spotted a tick anywhere that day. Where’s there’s one, there’s likely many more. Use a flea comb on your dog after a walk in tick country; pay close attention to the head, paws, and legs. Also keep in mind that even if an infected tick has embedded itself in you or your pet, you still have 36 hours to remove it before it transmits Lyme disease. Don’t let your guard down. 4) Commonly used insect repellents are effective at keeping ticks at bay. An in-depth comparative study (Tick Repellents: Past, Present, and Future, published in Pesticide Biochemistry and Physiology, 2010) found repellents containing DEET to be more than 90 percent effective at repelling tick bites, followed by oil of lemon eucalyptuys (88 percent effective) and picaridin (63 to 78 percent effective, depending on concentration, which ranged from 5 to 15 percent in the study). The Department of Defense utilizes a two-part system for U.S. soldiers: a DEET-based repellent (3M’s Ultrathon) and permethrin-impregnated clothing. Permethrin is an insecticide that can be applied to clothing through a variety of commercially available, water-based treatments. As the applied solution dries, the permethrin bonds with the fibers; studies have shown it to be virtually non-toxic to humans once dry. When ticks crawl over treated fabrics, they come in contact with the permethrin, which kills them. Applications usually last two to six weeks, depending on use and the number of washings. usly simple tick removal device ($4, widely available online). 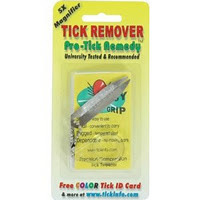 It has been the most effective tool of the many I’ve used to pull embedded ticks. 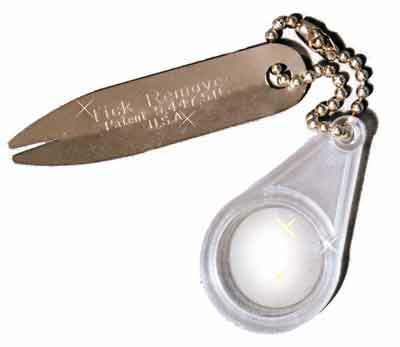 The Tick Key from Liberty Mountain (good pics of it in action) also garners excellent reviews ($4). Unless it’s your only option, avoid pulling ticks with tweezers—it’s easy to snap the mouthparts off under the skin. •They are largely inactive in temperatures below 45 degrees Fahrenheit. 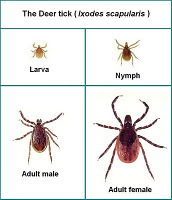 •Deer ticks are in the nymph stage from May to September, peaking in early to mid-summer (see chart). Their small size (about the size of a period or pin head) makes them much more difficult to spot. Consequently, nymphs transmit the majority of Lyme disease to humans.